With housing prices on the rise in both Canada and the United States, the next few years will be very interesting for those who are in or thinking about entering the real estate market. Traditionally the real estate market in Canada and the United States has moved in similar directions, but in recent years, the situation has changed. Driven by numerous factors, the real estate market has flourished in the Great White North, despite the massive free-fall of the U.S. market in 2008. We have been seeing huge increases on a yearly basis for top cities in the Canadian market, and in 2013 the average home price in Canada was 62 per cent more expensive than the average house in the U.S.. However, many argue a crash is still coming while pointing out that Canada has the most overvalued housing market on the planet. The U.S. is approaching the end of the Obama era with the housing market recovering from the mortgage and banking crisis in 2008, and has seen a steady increase since 2013. RentSeeker took an in-depth look into the rental markets market for both countries in an attempt to understand what the future will hold. Not to be taken as a comparative list on a city-by-city basis, this information will help get a clear picture of how much it currently costs to live in top five most populated cities in each country. Here's how much it costs to rent an apartment in the five most populated American cities. With a population of 8.5 million throughout the five boroughs, New York City is the most densely populated city in the U.S. and arguably the most famous. A global powerhouse at the forefront of finance, fashion and desirability, the saying goes, "If you can make it here, you can make it anywhere." Better start saving up because big dreams don't come cheap. The city of angels and home of Hollywood is no stranger to popular media. Desired for it's weather and famous lifestyles of the stars, L.A. is an extremely desirable place to live. As the second most populated city in the U.S., there are lots of rental options, but amenities and quality of finishes can greatly vary. In L.A., you get what you pay for. The largest city in the Midwest is home to nearly three million residents. Sports fans and foodies all over the country love Chicago and its beautiful waterfront, making it a popular city for weekend getaways. There are lots of housing opportunities with more affordable options on the edges of the city, but living by the water can be very costly. The largest city is the southern states is home to just over two-million people and has a broad industrial base. From oilfields to aeronautics, Space City is one of the most diverse cities in the U.S. and home to many affordable rental apartments. 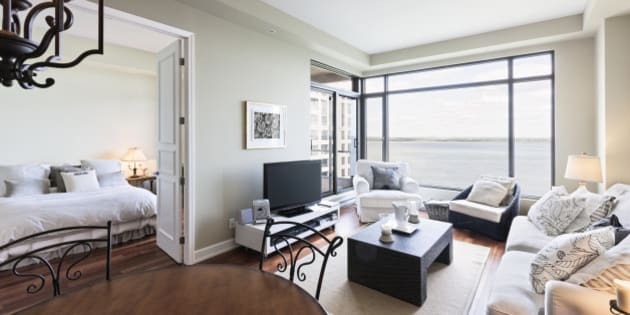 More than 1.5 million people live in the City of Brotherly Love, the fifth most populated city in the U.S. With a large downtown and large number of students across the various Universities and colleges, there are plenty of rental options to choose from. The second largest country in the world (in terms of size) hardly has a population to match. Our population of 35 million is less than the state of California, but more interestingly, an estimated 75 per cent of Canadians live within 161 km of the U.S. border. That means that despite our independence, we will always be linked to the U.S. financially, socially and physically. Here we examine how much it will cost you to rent an apartment in the five biggest Canadian cities, listed in order of population from largest to smallest. If you count the GTA as Toronto, there are tons of apartments to choose from. Home to nearly eight million people, there are as many apartments to rent in Toronto as there are sites to see and things to do. Montreal is a beautiful city and home to over four million people. From its bustling arts and music culture to its French delicacies, Montreal is a beautiful city to spend time in. The populous city in Western Canada embodies the spirit of the old west. While gas prices are starting to normalize, so are housing costs, but for now, there are great deals to find on rental apartments. The capital of Canada is home to many historic sites and the beautiful Rideau Canal. With so many government workers, there are plenty of rentals available in Ottawa. A cultural capital in Western Canada, Edmonton is a great place to live as long as you can take a chilly winter.